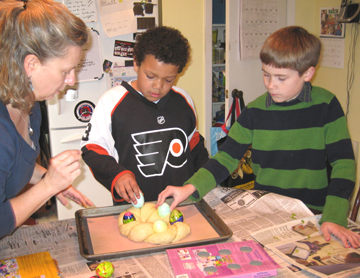 Leigh watches Michael and Benjamin place their eggs in the bread. Easter just wouldn’t be Easter without the Easter egg. This symbol of spring represents fertility, youth, and new beginnings—all the hopes that suddenly arise in our breasts when the sun rises higher and earlier again in the spring. 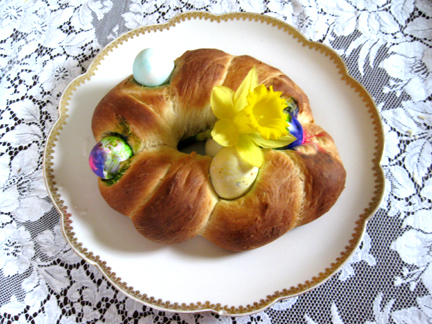 This braided loaf is made more festive (and more seasonal) by the inclusion of eggs in its folds. Plain eggs work just fine, but I always welcome an excuse to get kids coloring things so I asked my nephew Michael and his friends Benjamin and Carson to dye some eggs for my loaf. 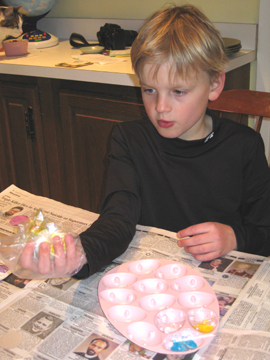 Carson rolls an egg in his dye. 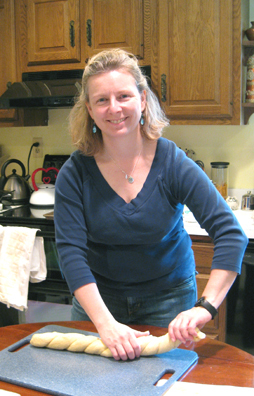 I got extra help from my sister-in-law Leigh, who is MUCH better at braiding bread than I am. So my Easter bread is a community event. I hope yours will be, too! Leigh braids the rolls of bread. In a small saucepan heat the milk and butter just to lukewarm; the butter will be soft but not melted. In a medium bowl combine 1 teaspoon of the sugar and the yeast. Pour the milk/butter mixture over them, and leave the yeast to proof for 5 to 10 minutes. Beat in 1/2 cup flour, the remaining sugar, the salt, and the 2 eggs; mix well. Add 1-1/2 cups more flour, and stir. Turn the dough out onto a floured board. Knead it for 1 to 2 minutes, adding a bit more flour as needed. Allow the dough to rest for 5 to 10 minutes; then continue kneading, adding more flour as needed, until the dough is smooth and elastic. Grease a medium bowl, and place the dough in it. Cover with a damp towel, and allow the dough to rise until it doubles in bulk, about 1 hour. Uncover the dough, punch it down, and divide it into 2 mounds. Let them rest for 5 to 10 minutes. Stretch each mound into a roll at least 24 inches long. Cover the braid with a damp dish towel, and let it rise until it doubles, about 45 minutes to 1 hour. Preheat the oven to 350 degrees about 15 minutes before you want to bake the bread. Bake the braided bread until it is a golden brown, between 35 and 55 minutes depending on your oven. Makes 1 loaf. This entry was posted on Tuesday, April 7th, 2009 at 4:47 am	and is filed under Breads, Muffins, and Scones, Holiday Foods. You can follow any responses to this entry through the RSS 2.0 feed. You can leave a response, or trackback from your own site. Love these pix! What fun! Thanks for sharing with us. Maybe daughter Kati will make this bread. She’s into bread making. Looks great and sound like you have fun doing it. I am doing braids tomorrow, well today I guess, it’s 3 am. I did a dozen ryes today plus some hot cross buns. No time to do a post on the buns though. Now just relaxing a bit, then up at 8 am to get the pastry baking underway. You have a HAppy Easter, and thanks for posting that MBall Soup too. too have some found Passover memories from time spent with friends. WoW! I’ll try your recipe. Great way to spend time with kids. Nice kitchen!